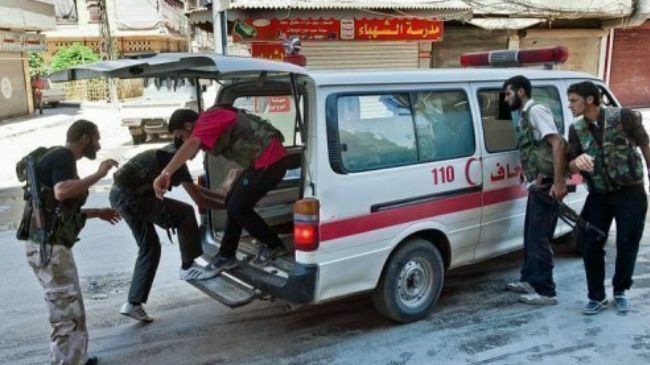 Weapons for insurgents in Syria are being smuggled in ambulances, reveals the Turkish newspaper Yurt, quoting a terrorist who witnessed smuggling operations. The revelation comes as analysts warn that an international push for renewed threats of military aggression against Syria is being planned to force the Syrian government to allow unmonitored cross-border humanitarian operations. In a report Yurt published on Sunday, the newspaper quotes a terrorist, using the initials “M.T.”, as saying that training courses for insurgents have been held on Turkish islands. M.T. added, that the training began long before the first violent episodes in Jisr al-Shoughour, in the Idleb province of Syria, at the beginning of the war in 2011. M.T.’s statement corroborates an abundance of evidence in support of accusations that the war in Syria has been planned with the support of foreign actors, long before the eruption of the so-called “Arab Spring” in early 2011.